Why can I disable/enable Mobile Data for "Phone"? Are there any public mobile network providers transmitting voice that way? Can voice "channel" get broken along with data "channel" still functioning? Your phone app requires data for things like visual voice mail which require a data connection. So, why can you turn this off? Most, if not all, domestic (at least here in the US) carriers do not charge you (count against your data allotment) for the data access required to get visual voice mail if you have a qualifying smartphone plan. International data or messaging charges apply to receiving, replying to and forwarding voicemail messages while roaming internationally. So, to prevent being charged while roaming, you can disable the data usage for the phone. Does this mean turning off mobile/cellular data for the Phone app will stop visual voice mail? No. As long as you have a data connection, including WiFi, you will get your VVM. It's when you're roaming and not connected to WiFi where you won't get it. How can I tell when HD Voice is being used in a phone call? 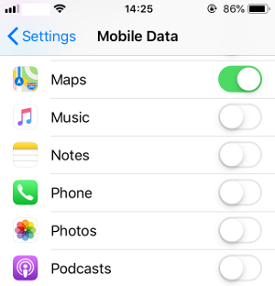 Is there an iPhone app available that lets me track data usage on a per-app basis?